If you are a golfer, you know you drive for show and putt for dough. But it still feels amazing to hit the sweet spot and drive further than you ever have before. To better your golf game, improving the flexibility of your spine will help. To better your putt, then you need to better your balance. Your feet are the foundation on which you stand. If you have a foot that collapses more than the other, then your body's "foundation" is unleveled, unleveling your entire body. How can you be expected to putt straight if your body is not standing straight? 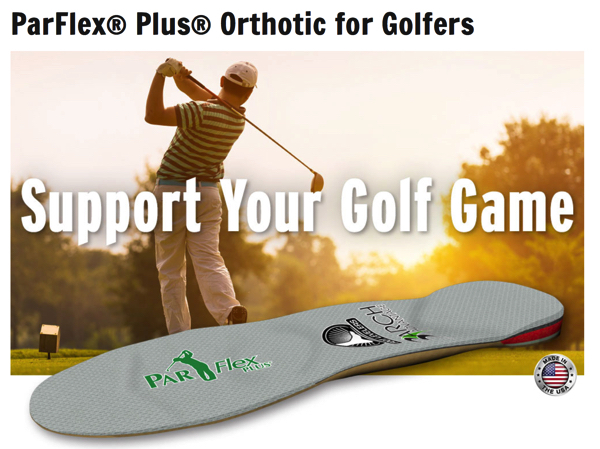 Par Flex orthotics can help! Call today for a free foot scan to see how your feet are affecting your golf game! FOR GOOD QUALITY SLEEP, I cannot stress the importance of having the best possible mattress. You (hopefully) sleep at least eight hours of every twenty-four hours. This is one-third of your life. If you are going to spend money on one item, it should be your mattress. The best mattress that I know of. For years, I have looked for the perfect mattress. I had settled for foam mattresses, or at least mattresses topped by a foam topper. Then, finally, I came across what I consider to be the best mattress ever. It took a team of engineers, guided by a chiropractor, to create a mattress that exceeded my wildest expectations. 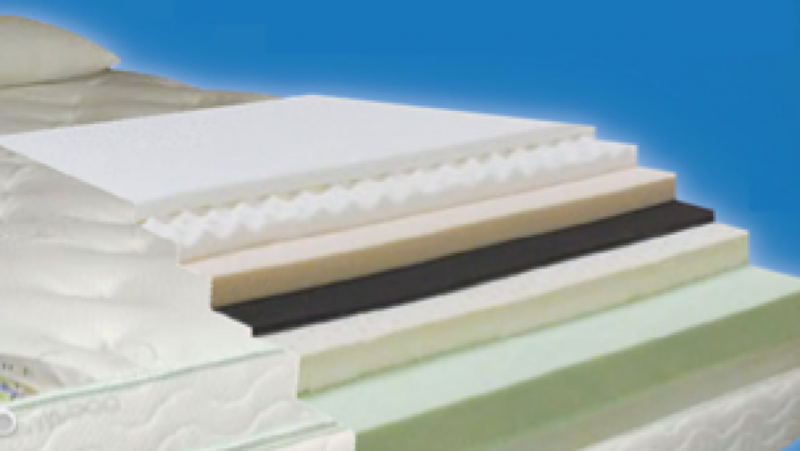 Unlike other foam mattresses, the Innate Sleep Orthopedic Sleep System is multilayered. What separates this mattress from all other foam mattresses is its unique third layer. This third layer is a thin yet sturdy layer of interlocking foam that bows up between two points of downward pressure. Your spine is curved, and this bowing action in the mattress provides more support to these curves. It creates a wave to match the curves of your spine when you are lying on your back; it also creates a wave to accommodate the curves of your body when you are lying on your side. It fits you whether you are large or small. Other foam mattresses are good at reducing pressure on thicker areas like your shoulders and hips, but they are not good at supporting the thinner areas like the waist and neck. This can negatively affect the low back and neck as you sink into the foam mattress. A healthy aligned spine makes an S curve. The bowing action of the third layer in the Innate Sleep System creates a wave that supports this curve. It is similar to how the lumbar support in the seat of a high-end car can be pumped up to support the curve of your low back while you drive. With this mattress, you hardly need pillows because the mattress bows up where you need the support. Can you see how this multilayered foam mattress is so much more than a foam mattress that just takes the pressure off the pressure points? Can you see how it also supports the curves of your spine? Compare the positions of the spines in the featured image at the top of this page. Not only does this mattress support your spine in the best way possible, it is also earth and health friendly. It uses botanical foam made of corn and soybean, so it doesn’t give off gas like petroleum-based foam does. This was important to me because I could not sleep on my first foam mattress for months because it stank so badly. It uses a flame-retardant cover, instead of being sprayed with toxic flame-retardant chemicals, to meet federal guidelines. An Innate Sleep System mattress is cheaper than other therapeutic foam mattresses. When this blog was written, a king-sized bed with box springs and white-glove delivery cost in state was $3,850.00. Plus, the company has great customer service. It has a thirty-day no-questions-asked return policy. Plus, the company offers a fifteen-year warrantee where they will fix the mattress if the foam loses any feeling of support. You just have to pay for the material and shipping. Foam does deteriorate over time, so the top foam layer may need to be replaced within ten years. If you choose to pay the cost of the material and shipping, you will basically have a new mattress that should last you another ten years for a few hundred dollars instead of a few thousand dollars. The mattress is made in America (specifically Indiana). This company has surpassed all of my expectations. It feels good to finally have a mattress I can recommend! If you would like to purchase this mattress, ask your chiropractor if they can order it for you. If not, contact me at [email protected]st.net, and I will set you up. You can learn more at http://innatesleep.com. If you choose not to invest in an Innate Sleep System mattress, your mattress should be firm for support with at least an inch of foam on top to minimize pressure on your body. I recommend a separate foam topper so you can replace it every three to five years (foam loses its supportive qualities within this time). You should also flip a regular mattress every three months or so, which extends the life of the mattress. The best way to sleep is on your back with a small pillow contoured to support your neck and a wedge pillow under your knees (refer back to Figure 5-3). When your knees are bent, your back flattens out and is fully supported by the mattress. Not only is sleeping on your back better for your neck and back, but it also keeps your face looking younger because it keeps you from rubbing the skin on your face against a pillowcase all night. If you are a side sleeper, sleep with a thick neck pillow so your neck remains in a neutral position. If you sleep with your head tilted to one side, you will compress the nerves on the down side and pull on the nerves on the up side. The compression or stretching of the nerves can lead to neck pain and possibly headaches. When sleeping on your side, you should also sleep with a pillow between your knees to keep your hips and thighs parallel to one another (helping to keep the lower half of your body in a neutral position). Otherwise, you may strain your pelvis, tailbone, hips, and/or knees as you sleep. I personally use the Pillo-Pedic pillow from Foot Levelers. Because it has a soft and hard side with thick and thin edges, the Pillo-Pedic pillow is like having four pillows in one. The design makes the Pillo-Pedic great for both side and back sleepers. If you are a side sleeper, lay the Pillo-Pedic with the hard foam side up (Figure 5-7). When lying on your side, you don’t want or need your head to sink into the pillow like you do when you are sleeping on your back. If you sleep on your back, lay it with the soft side up (Figure 5-8). This allows your head to sink into the pillow and your neck to be supported by the firmer foam edge. The Pillo-Pedic has a thick and thin firm foam edge. Whether you lie on your back or side, place the thick edge against your shoulders if you have a long neck; use the thin edge if you have a short neck. Foot Levelers also offers other pillows for specific needs. They can even make a custom-made pillow based on four measurements taken by your healthcare provider. I always suggest they discuss this with their chiropractor to be sure the positioning is ideal for the conditions that they are working on (i.e., right shoulder tendonitis patients should avoid sleeping on the right side). If your sleep is interrupted with back pain, neck pain, a headache, or numbness in your arms, hands, legs, or feet, you are pinching your nerves while you sleep, and you need to change something. If you wake up with more pain than before you went to sleep, you probably need a new or better mattress and/or pillow. Pain affects the quality of sleep and can interrupt it, and a new mattress and or pillow can help. Talk to your healthcare providers and employees at your local mattress stores to find someone who can help you with your specific needs. To learn more on sleeping well, look for my up and coming book, “Combat Insomnia”. Sleep hygiene involves living in a way that physically and biochemically helps the body sleep. Before the advent of electric lights, it was normal to go to bed when the sun went down, wake up in the middle of the night to stoke the fire (with its red glow) and have some fun, and then go back to bed. Old texts talk about this first and second sleep. It was also common to have naps in the middle of the day, especially on long hot summer days when the days were longer, causing later bedtimes and earlier morning times. Now we have artificially set times that we go to bed and wake up, disrupting our natural sleep cycles. So if you find yourself regularly waking up in the middle of the night, do not despair. This could be your natural cycle. If you have trouble falling asleep, avoid overhead lighting and looking at backlit screens for at least two hours before bedtime. Artificial lighting messes with our internal clock, making our light-sensitive brain think it is still high noon. As a result, our brain delays preparing for sleep and doesn’t produce melatonin. At bedtime, switch from overhead lighting to bedside or table lamps, which mimic the sunset. If you must look at a screen at night, adjust the screen to the lowest level of brightness, wear red glasses, or use a “twilight” app because the blue light emitted from computer screens hinders melatonin production. If you wake up in the middle of the night, avoid bright light (especially white or blue light), release some stress with some light activity, and then attempt to go back to sleep. When I wake up in the middle of the night and have trouble going back to sleep, I take a dose of melatonin, put on my red glasses so I can work on the computer without messing with my internal clock, work on the computer for less than an hour, and then put the computer away and meditate until I fall asleep. One lifestyle habit that aids in sleep is keeping a regular schedule in which you get up and go to bed at the same time every day. Getting into a regular routine helps keep our internal clock in rhythm. The rising and setting of the sun is the most important factor in keeping our internal clock in rhythm, but with the advent of artificial light, this is often skewed by having bright lights on well past sunset. When you work a night shift, your internal clock is forced out of synch with natural light and dark cycles. The good news is that if you keep a regular schedule of light versus dark, your body can acclimate to a night shift. But if sometimes you stay up late and sleep in, and other times have to wake up early, this irregular schedule messes with your internal clock, making it difficult for your body to know when to prepare for sleep, similar to what happens when you have jet lag (see Chapter 1 for details on jet lag). If you feel tired during the day, allow yourself to take a nap in the middle of the day, or at least rest, so you do not crash and fall asleep too early that night, which would mess with your regular sleep schedule. A physically exhausted body sleeps better. It’s best to exercise first thing in the morning for several reasons. One, you are more likely to do it. Later in the day you may be too busy or tired to exercise. Two, exercise energizes you. You generally want to avoid intense stimulation right before going to sleep. Still, I believe it is important to exercise every day, so if you cannot exercise during the day, it is better to get some exercise in the evenings than not at all. With that said, if you suffer from insomnia, make it your daily routine to exercises every day by noon, if not first thing in the morning, for at least thirty minutes. Your room should be as dark and quiet as possible. Our brain is light sensitive, as discussed earlier in the chapter, so light can impair sleep. Use blinds or curtains to block outdoor light, and close your bedroom door if light shines into your room from other parts of the house. Our brain’s thalamus determines whether external stimulation needs the attention of our consciousness. This autonomic gatekeeper allows us to sleep unless we need to be awakened to face a potential threat. If noises are present, our sleep can be interrupted. We may not be able to control some aspects in our life that impair sleep, but the volume of noise should be controllable. So keep your sleeping area as quiet as possible. If you can hear noises outside of your control when you are trying to fall asleep, try playing soothing sounds to drown out the interfering background noises. Parents and caregivers read or sing to children at bedtime because soothing sounds can lull them to sleep. This technique can also work on adults. You can try listening to lullabies, a recorded story, or audiobooks with calm or soothing content. Don’t choose something stressful or a recording that has a laugh track that might wake you up after you fall asleep! I often listen to soft rhythmic drumming or meditative music if I don’t fall asleep after my contract-relax muscle routine. Some find white noise machines helpful (more on this in a later chapter). Allergies occur when the body attacks pollen antigens because it thinks they are antigens on a virus or bacteria. This confusion leads to cold-like symptoms but without the actual sickness. When your body is confused, its defenses can hurt you instead of help you. Allergies cause congestion, which negatively affects sleep. If you suffer from seasonal allergies, try eating a teaspoon of local honey; the beehive should be within 25 miles of your home (as the crow flies). Honey from a hive close to your home is filled with pollen antigens you are breathing. When you eat it, the body learns that the pollen antigens are “self”—something good that you assimilate into your body for energy—and not a “not self”—a foreign thing that needs to be attacked. When you are stressed, your body releases stress hormones into the body. This puts us in a fight-or-flight versus a rest-and-digest mode. How can you expect your body and mind to sleep when they think there is still a tiger in the room? You can’t sleep until these hormones fall to a level where you can rest and digest again. Sometimes when you’re stressed, you just need to cry and release your emotions, but society has taught us that it’s not acceptable to cry. Holding back tears causes tension and creates more stress. Stress is a major cause of insomnia; it leads to dis-ease that leads to disease (heart problems, high blood pressure, stomach ulcers, and all sorts of other health issues). First, let me describe the three types of tears. Basal tears: These tears lubricate the eyes so they don’t dry out. Psychic tears: These tears are due to emotional stressors (both extreme happiness and sadness). The best way to purge stress hormones from your body is to release your psychic tears. Emotional (psychic) tears are composed of different compounds than the basal and reflex tears. They consist of protein-based hormones like adrenocorticotropic hormone (a type of stress hormone). I find it astonishing that the body removes excess stress hormones and other toxins by excreting them through the eyes in the form of tears. Crying is simply essential for the body to release stress, relax, and heal. Not only do we gain physical benefits when we cry, but if we’re in the presence of others, we gain social benefits as well. We are social beings, and when we cry, we communicate our emotional state, helping others determine our needs. Even though the psychological aspect of the healing process is difficult to understand, many people agree that expressing sadness and getting a hug (or some sign of sympathy or empathy) help us feel better. The complexity and interplay of the body’s systems never cease to amaze me. Medically, we often look at each part of the body in isolation. We fail to see how one part of the body can affect another, let alone consider how something like refusing to cry can affect your ability to sleep. To learn more about sleep and how to improve your sleep, look for my up and coming book “Combat Insomnia”. <2]<="">Wilson, “In the Clinic. Insomnia,” Annals of Internal Medicine. There has been much debate over whether people should take vitamins. If you are eating a healthy, varied, and whole-foods diet, you should be able to get all of your needed vitamins through your food. Unfortunately, most of our food is grown on over-farmed land, so the food produced on it is deficient of micronutrients and genetically designed to look good and have a longer shelf life (with no effect to its nutritional content or taste). My general advice is to take a half dose of a multivitamin every day or two. That way you are less likely to be deficient in anything and you avoid the risk of overdosing on anything. As someone who studied chemistry for three years before switching gears to follow my true passion of wellness, and chiropractic, I’ve paid a lot of attention to the chemical composition of vitamin supplements. With this added knowledge, I stress that if you are taking a multivitamin, make sure the vitamins come from plant sources. Plants build vitamins via very complex biochemical processes, producing one specific biomolecule. When vitamins are produced in a lab, an unnatural form can be produced and included in the multi-vitamin pill. For example, vitamin E has two forms of isomers, an L-alpha-tocopherol and a D-alpha tocopherol. Isomers are chemicals that are the same but mirror images of each other. Sometimes this does not matter. For example, the shape of a cube is the same as the shape of its mirror image. But many shapes are not the same as their mirror image. For example, your left (L) hand can be thought of as the mirror image of your right (D), but any image of a hand, when looked at carefully, can be recognized as either a right or a left. Vitamin E has a left and right version. Only the right-handed version works in our body. To help you understand why one works and the other doesn’t, think of a how a lock and key works. Imagine a lock that requires the fingerprints of your right hand to open. Now, place your left and right hand on a table in front of you. Can you see how your left hand wouldn’t be able to open that lock? Do you see that the mirror image is not the same item as the original item? Look at your vitamin labels, and if it says the Vitamin E is dl-alpha-tocopherol, it means it has both the unnatural form of Vitamin E as well as the natural version (hence the “d” and the “l”), and in my opinion, it should be thrown away. Look for a multivitamin that has the d-alpha-tocopherol (not the dl-alpha-tocopherol). It’s one thing to take vitamins. It’s a whole other thing to absorb them. Vitamins are of no use to us if we just poop them out. So many people are on fat free diets, trying to lose weight. But we need healthy fat to absorb fat-soluble vitamins! I don’t avoid eating fatty foods as long as they are healthy fats. Avocado, wild salmon and walnuts are a few examples of tasty foods that are full of good fats. I use organic REAL butter as it does not increase risk of cardiovascular disease as we thought (31). Margarines and other fake butters are unnatural, according to some research, unhealthy and even related to weight gain! Fat-free diets are not healthy because you need fat to digest your fat-soluble vitamins (Vitamins A, D, E & K). I can’t stress enough the importance of good fats in our diet. It is fat that protects every cell in your body, including the cells in your brain that help you think clearly and make good decisions. Cell membranes (the coating of every cell) are mostly made of fats (two layers of phospholipids), with chunks of proteins and sugars throughout the two layers of fat. Fat has a bad reputation because, like anything, it is not healthy to ingest it in excess. Plus, most people do not drink enough water. We need water to absorb the water-soluble vitamins. To calculate how much water to drink daily, multiply your body weight by half and use that number to determine how many ounces of water to drink in a day. For example, I am 126 pounds, so I should drink (126 x 0.5) or approximately 63 ounces a day (almost eight 8oz glasses a day). Also, for every half an hour you exercise in a day, you should add at least another 10 ounces. Now, if you drink black tea, coffee and/or alcohol, you need to drink even more water. Tea, coffee, and alcohol are fluids that actually keep you in a dehydrated state because they interfere with your anti-diuretic hormone (ADH). The hypothalamus (a part of your brain) detects how much water is contained in your blood. If the water content is low, it tells the pituitary gland (the master gland of your body, also in the brain) to release ADH (antidiuretic hormone) into your bloodstream. When it reaches the kidneys, ADH opens the kidneys tubules so more water is reabsorbed into your blood (instead of urinating it out). Once the water pressure goes back up, the hypothalamus will detect this, and will tell the pituitary gland to STOP producing ADH. The ADH levels drop in the blood, and the tubules will close down, so that more of the fluid will flow out into the urine. This negative feedback loop ensures that our blood holds the perfect amount of water. Simply put, if you drink too much water, the body has a means to urinate out the excess, but keeping a healthy amount in, as long as you eat and urinate as needed. As with anything you ingest, it is possible to overdose, but it would be difficult to do so. You can google hyponatremia if interested (too little salt in the blood from either not enough salt or too much water intake). I find most people are in a dehydrated state. When you drink fluids like tea, coffee and alcohol instead of water, ADH production goes down, and the result is excreting too much water in your urine, leading to dehydration. Dehydration has a nasty effect on one’s health, especially over the long term. So, in any given day, for every ounce of alcohol, and for every cup of tea/coffee, you should drink at least eight additional ounces of water. Take plant based vitamins, eat enough good fat and drink enough water to be able to absorb the vitamins from your gut for the delivery to every cell in your body that needs these vital nutrients. Your whole body will function better as a whole if every cell of it’s make up is healthy. HOLDING YOURSELF FOR ANY LENGTH of time in any still position will negatively affect the health of your body. This is not limited to your work station. Holding smart phones, tablets and/or laptops in your lap causes you to look down for extended periods of time. This strains not only your neck, but your spine, shoulders, wrists, and more. We healthcare providers are seeing the effect of this at such a degree that we’ve coined the term “iPosture” for people who are experiencing poor posture and pain as a result. To combat “iPosture,” the first, most important prevention is movement. While you are standing or sitting for a prolonged period of time, the second key preventative behavior is keeping your spine neutral as much as possible. When looking at your smartphone (using it for its computer or texting capabilities, as opposed to using it as a phone), hold it high enough so that your neck remains neutral, not bent at an angle or bowed. In other words, hold your phone higher than your lap, ideally at eye level. When working on your laptop, use it on a desktop or tabletop that allows your forearms to rest at about a 90 degree angle, parallel to the desktop, without slumping or hunching your shoulders. Despite the name, do not work with your laptop on your lap because you’re likely to hunch your shoulders and kink your neck to look downward too long. Here is my posture advice for people who find themselves in front of a computer for extended periods of time. Follow these suggestions to set up your working space in a way that will to minimize problems caused by poor posture. Just remember to move every 20 minutes, no matter how proper your posture is. 1. Keep your chin tucked in and head back, so your ears are over your shoulders. Jutting your head forward causes your chin to tilt up so you can see what is in front of you. This posture causes compression to the posterior parts of your neck, including the discs between your cervical vertebrae, the nerve rootlets that run down your arms to your fingers, and strains your posterior neck muscles. The further your ears are in front of your plumb line (the center point of gravity), the more compression you cause. A deep slouch will even put pressure on your spinal cord (just minimally, but still, no pressure on your spinal cord can be good). 2. Your eyes are “lazy,” and like to tilt downward about 15 degrees. If your monitor is too high, you will end up tilting your chin up so that your eyes can tilt down. This results in compressing your posterior neck. So bring your monitor to the level such that when you tilt the monitor back 15 degrees, the eyes naturally look at the middle of the screen. Your screen should be able to tilt and swivel. The surface should be flicker free and reflection free. 3. It would be optimal to have a window to look out periodically to exercise your eyes. If you do not have a window to look out of, go to a window to look outside and focus on a distant object every time you leave your workstation. More on this in Chapter 8. 5. Your mouse and keyboard need to be at a height to allow your elbows to be at 90 degrees at your sides, such that your lower arm is horizontal (parallel to the floor). A good chair will have an adjustable height to be able to make the adjustments needed for correct arm and leg positions. A good standing desk will have an adjustable height to allow for correct arm positions. 6. Keep your upper arm vertical, with your chest open and shoulders relaxed back and down. If you are standing, make sure your knees are soft and your feet are hip width apart. Wear comfortable shoes and stand on a thick, rubber mat. 7. Your seat should be at a level so that your knees are 90 degrees and your feet are flat on the floor. For those who wear high heels, this is a good time to take them off (no one will see your feet under your desk). This is a good time to stretch your toes to help prevent bunions and hammer toes. 8. Make sure your low back is supported by a lumbar support pad in the chair or a lumbar support pillow. A good chair will have an adjustable back rest height and angle to provide you with proper support specific to your needs. Many shorter-than-average or taller-than-average people should look for chairs made specifically for their size. Remember, if you’re spending many hours a day in a chair, it’s worth the investment of having one that fits your body properly! If you are one to wear a wallet or store other items in your back pockets, make sure to take them out of your pockets while you’re sitting, to avoid a pelvic tilt that can throw your whole spine out over time. 9. The base of your chair needs to be solid (a five star base if it is mobile with wheels). Make sure the floor is level and flat. I have had patients come in with chronic back pain, only to discover that their treatments were not lasting because the floor at their work station was not level. If your floor isn’t level and you have to work to hold your rolling chair in place all day long, you will strain your back muscles unevenly, constantly pulling the spine out of alignment. 10. Do not sit crossed-legged, as doing so twists your pelvis causing additional strain to your spine. Crossed legs also interfere with your veins’ ability to pump blood back from your legs toward your heart, potentially increasing your risk of developing varicose veins. 11. Your desktop should be thin for maximum thigh space, with the keyboard in front of you. i. Place your printer in a different room, so every time you print something you have to get up and walk to get it. ii. Position your phone out of reach, to remind yourself to get up and walk around while you talk on the phone. iii. Store your tissue box, stapler, extra pens, and anything you reach for throughout the day just beyond your arm’s reach, so you have to get up and move to get these things when you need them. On a side note: pregnant ladies should be especially attentive to moving throughout the day. They should also completely avoid sitting cross-legged. It is my observation that pregnant women who sit for prolonged periods of time tend to end up with their babies breach. Sitting cross-legged adds increased pressure to your lower pelvic bowl, and that pressure would work against the baby dropping head down in the last weeks of pregnancy. Maybe there will be studies to prove this one day. For now, I advise pregnant women to avoid sitting cross-legged. Instead, they should sit with their knees apart and the buttock pressed out and back, so there is plenty of room for the baby to drop down, especially in the last weeks of pregnancy. 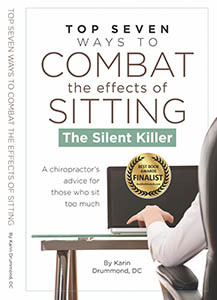 To learn more, check out my book “Top Seven Ways to Combat the Effects of Sitting: The Silent Killer”. Available on Amazon.